Justin Lewis when he was undergoing chemotherapy. 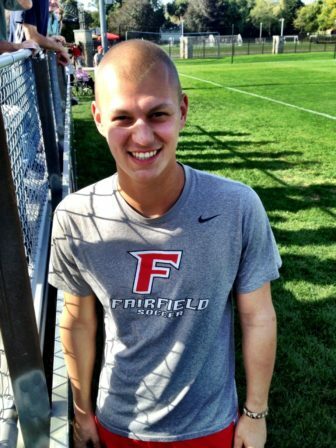 Susan Lewis’s soccer-adoring son Justin was already through his chemo and radiation treatments for lymphoma and thinking about getting back to his team at Fairfield University when she caught a television report one morning. The report was about cancer cases among athletes playing on artificial turf made from ground-up used tires – crumb rubber is what it’s called. Some soccer players in particular had been diagnosed, mostly with lymphoma as well as leukemia. The question posed was whether the crumb rubber was the cause. What Susan didn’t know was that she was also jumping into an escalating controversy over the safety of crumb rubber and that her home state of Connecticut was right in the middle. Let’s be clear – as of now no study has shown a definitive link between playing on crumb rubber and any illness. But official receptivity to doing further research has been growing in recent months, and Friday the Environmental Protection Agency (EPA) said it is launching a federally coordinated action plan to study crumb rubber turf fields and playgrounds. The Consumer Product Safety Commission (CPSC) and the Centers for Disease Control and Prevention (CDC) will be part of the effort. Initial results are promised by the end of 2016. The EPA and CPSC had already modified earlier stances on crumb rubber’s safety and had endorsed additional testing, and, most notably, the Connecticut Department of Public Health (DPH) had quietly clarified an oft-cited 2010 study on it. The study was conducted by DPH, the Department of Energy and Environmental Protection, The Connecticut Agricultural Experiment Station and the University of Connecticut. It was vetted by the Connecticut Academy of Science and Engineering and has served as evidence of crumb rubber’s safety for industry groups and other advocates of its use. DPH officials declined to be interviewed for this story, but a statement emailed by a DPH spokesman acknowledged the concerns about crumb rubber. The statement said in part that these concerns “raise important questions about the safety of these fields and suggest more comprehensive study is warranted. That sentiment, as of late 2015, is reflected on the DPH’s own crumb-rubber fact sheet. All of this has occurred against the backdrop of a relentless barrage from the New Haven-based advocacy group Environment and Human Health Inc. (EHHI), which has been warning of potential health threats from the fields. It’s well-known that tires contain a host of chemicals and compounds. Getting rid of used tires has been an environmental conundrum for generations. 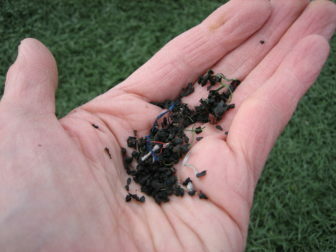 In the 1990s, the idea of recycling them by making the rubber portions into crumb-sized pellets was developed – and a major use for the pellets became the so-called infill for artificial athletic fields. The pellets, or crumb, were essentially poured into the fake grass to provide padding that was far superior to earlier incarnations of artificial turf. The playing surface it provided, by all accounts, was surpassed only by extremely well-groomed natural grass. “You can basically judge where the ball’s going to go if it bounces. It doesn’t hit a hole or a ditch or a bad patch. You just know where it’s going to go because it’s all flat,” said Justin. He started playing soccer when he was 5 or 6 – first on grass, then on turf, beginning when he was 14 or 15 as a player at Bunnell High School in Stratford. It also got very hot. A 90-degree day can push the field temperature to more than 140 degrees. Members of Bunnell’s football team got burns during a practice last summer. Justin said he gets blisters on his feet from it. His friend Joe Martin, a goalkeeper on the Fairfield University team, which plays its home games on grass but practices on crumb rubber, said summer is bad, especially when you’re out of breath. For many municipalities, though, crumb rubber seems like a no-brainer. Aside from a way to keep old tires out of landfills, it requires zero water and little maintenance. Drainage is excellent, so there are no muddy fields or hard-frozen ones. And it enables fields to be used around the clock, unlike grass, which requires resting, reseeding and other forms of TLC. That in turn means more kids can play more different sports more frequently, making the high upfront price of nearly $1 million per field cost-effective in the long run. It also solves the problem of dealing with the state’s pesticide ban for municipal fields, day-care centers and school fields serving kindergarten through eighth grade. High schools do not have a pesticide ban, but many think it’s just a matter of time. There are an estimated 12,000 crumb rubber fields in the U.S. Dozens have been installed in Connecticut since the first one in the late 1990s – many built using state bond funds to pay all or part of the cost. There are school fields, municipal fields, playgrounds and private fields. Most are outdoors. Some are in. It took an associate women’s soccer coach at the University of Washington named Amy Griffin to push the concern about crumb rubber into the public consciousness. Griffin started noticing cases of cancer among soccer players, especially goalkeepers. So she began a list. She knows it’s not scientific – it’s people who contact her. But it now has more than 200 athletes on it. More than three-quarters are soccer players and about two-thirds of them are goalkeepers. Most of the cancers reported are lymphomas, Justin’s among them. The questions raised about crumb rubber that arguably resulted in Friday’s announcement by the EPA have also brought hard pushback from the artificial turf industry. It points to many studies over the years that have shown no elevated health risk from the fields. “The best available evidence out there indicates that there really aren’t concerns related to health effects from chemical exposures in turf,” said Michael Peterson, a toxicologist with the environmental health and risk science consulting firm Gradient who has been retained by the Recycled Rubber Council as a scientific advisor. His views are echoed by the Safe Fields Alliance – representing the top three turf manufacturers, and the Synthetic Turf Council – the trade association for the artificial turf industry. “Exhibit A” is almost always Connecticut’s 2010 study. DPH’s recent revision of that position followed similar action by the EPA and CPSC. Both essentially said that previous studies that showed no elevated health risk from crumb rubber could not be considered comprehensive enough to answer new questions about the fields’ safety. Both agencies said they would be assisting a study just underway by the California Office of Environmental Health Hazard Assessment. Results from that study are not expected until 2018. The new federal action plan will access information from that study. The EPA revised its position in November 2015. The CPSC began doing so in September. The CPSC has since issued a series of statements endorsing further research and has requested $1 million as part of its budget to do some additional testing. Some of Commissioner Elliot Kaye’s statements were in response to a letter from Sens. Richard Blumenthal, D-Conn., and Bill Nelson, D-Fla. The senators were asking for assurances that any study would be independent, noting that the California agency that requested its study oversees recycling, including tires. Last month Blumenthal and Nelson followed up with a letter to President Obama requesting a federal study coordinated through the CPSC, EPA and the Centers for Disease Control and Prevention. 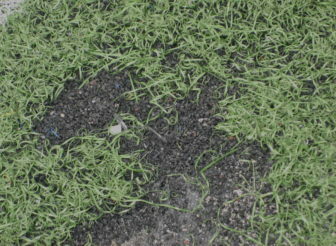 Crumb rubber infill shows through a bare spot in a synthetic turf field. Gaboury Benoit, an environmental chemist at Yale, may be providing one of the first steps down that path. He is just finishing what he believes is the most comprehensive determination of what’s in crumb rubber. It’s a devilish task since tires from different companies and for different purposes have varying ingredients. Ground up together for crumb rubber, chemical compositions can vary tremendously. While still incomplete and unpublished, Benoit said he has found nearly 100 compounds, about half of which have been studied for health risks. Within the studied half, about a quarter are known carcinogens and another 40 percent are known irritants, he said. Others, including the Recycled Rubber Council’s Peterson, have criticized Benoit’s work, which was funded through a grant secured by EHHI, for the samples of new crumb rubber it used, its laboratory technique, which Peterson said was “not a relevant exposure scenario of what happens in real world,” and its lack of information on the concentration of the compounds. “Just the presence of a chemical doesn’t tell us much from a toxicology or a risk-assessment perspective,” Peterson said. But Benoit said that was not the point. Looking at how heat, for instance, changes the substances in crumb rubber, or conducting field-based studies would be next steps. David Brown, a toxicologist who now works with EHHI, agrees. Brown, who is also formerly with the CDC’s Agency for Toxic Substances and Disease Registry and the Connecticut public health department as director of the environmental, occupational and environmental health section, also contends sample sizes in existing studies were too small. There’s no information on how the cocktail of compounds in crumb rubber may interact, nor has there been a genuine study of long-term exposure. The goalkeeper cancer cases in particular are raising questions about whether research should focus more on the types of contacts they have with the field: diving into the ground; slides that can get crumb in their mouths, eyes and hair; a greater chance of turf burns or wounds that crumb can get into; and their general play closer to ground level. Since the late 1990s, the Cheshire-based engineering and planning consultant firm Milone and MacBroom has overseen the installation of dozens of athletic fields – many, if not most, crumb rubber. As environmental consultants they have done their own runoff testing and looked to the many crumb rubber studies, Connecticut’s in particular, to support their contention the fields are safe. 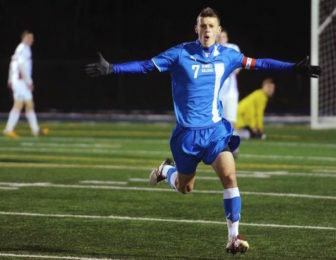 Justin Lewis celebrates on his high school soccer field in Stratford. McDermott has heard all the arguments against crumb rubber and at zoning board and other community meetings contended with Alderman of EHHI over installation of the fields. Along with many other studies, links to the 2010 Connecticut study and the January 2015 reaffirmation are still on the company website, but not DPH’s latest assessment. “Until the studies, the new data, if there is new data, comes and tells us differently, I think we’re relying on what we know,” he said. “Until we see to the contrary, we’ll say this is OK. But since 2007 or so, the company is finding that clients are not comfortable with the unknowns of crumb rubber risk, and so Milone routinely offers pricing for new infill products – some made from coconut or rice husks, cork, coated sand or some combination of them. And even with a 25 to 30 percent additional cost and the need for more maintenance – like watering cork-based infill – communities are beginning to opt for the alternatives, even as they balance the crumb rubber concern against equally nettlesome safety and concussion concerns. Hartford has gone a step further. In the first update of its zoning regulations in 50 years, the city has banned crumb rubber and petroleum-based artificial turf. “In a dense urban environment like Hartford, any negative environmental and public health effects of synthetic infill could be magnified. So the uncertainties about these effects weighed heavily on our decision,” said Sara Bronin, a zoning board commissioner appointed in 2014 by then-Mayor Pedro Segarra. She is also director of the Center for Energy and Environmental Law at UConn Law School. “Rather than permitting synthetic infill and hoping for the best, we want for the science to show that these materials are safe before we permit them in Hartford,” she said. But other communities, including Plainville, Stonington and Seymour, all of which recently installed artificial turf fields, chose crumb rubber over the newer alternatives. Some cited the cost; some cited the lack of a track record for the alternatives; but all essentially said crumb rubber was innocent until proven guilty. “Based on what we know today, they’re safe, and if they’re not, we’ll have to make an adjustment,” said Plainville Town Manager Robert Lee, who acknowledged that the town was aware of the calls for further study. In Seymour, Nicole Klarides-Ditria, chair of the Seymour turf project as well as a Republican candidate for the House, said she’s familiar with crumb rubber through her job as an athletic trainer. She’s comfortable having her own son play football on it. Right now, nowhere is the crumb rubber controversy playing out more publicly than in Hamden. The town, which has had a crumb rubber multi-sport field for 13 years at the high school, is in the final throes of approving a new one for baseball. “Tires are toxic – can’t argue that,” said James Pascarella, Town Council president and until recently an assistant football coach. There is legislation filed by the state legislature’s Committee on Children to ban crumb rubber fields. Though it is generally viewed as a non-starter, it is among the bills scheduled for a public hearing by the committee on Tuesday. Failing a ban, EHHI wants the state to stop allowing the use of bond funds to pay for crumb rubber fields. Sen. Ted Kennedy, Jr., D-Branford, who as co-chair of the Environment Committee and a member of the Public Health Committee, would probably deal with any legislation related to the fields, is blunt. Some would like to see the CPSC designate certain crumb rubber products as child products to make them subject to more stringent health regulation. Nicole Potter will probably never know if that would have changed her life. In 2013 at the age of 23 she developed an acute form of leukemia. 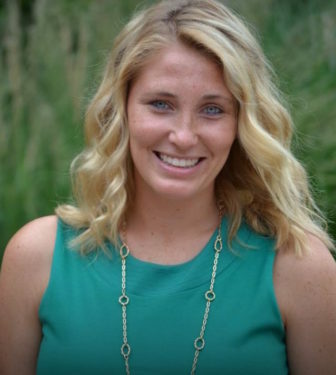 She’d played soccer since she was 4 or 5 years old, much of the time as a goalkeeper and on crumb rubber artificial turf for a combination of teams, including travel leagues, indoor leagues and Daniel Hand High School in Madison, where she grew up. Potter never knew about the recycled-tire controversy until she was through her six months of treatment. She’s in remission and scheduled to finish maintenance chemo next month. She will never be allowed to play contact sports – including soccer – again. If there turns out to be a link between her illness and the fields she played on, “I’ll be really pissed,” she said. Nicole isn’t sure a moratorium on new fields would be the way to go. Testing yes – but the right testing. His mother Susan said he needs to live his life under his terms, but if she were calling the shots about whether he should play, “I’m not so sure I would let him,” she said. This story was updated at 1:25 p.m. to include an EPA announcement of a new federally coordinated study of crumb rubber fields.